A San Jose man suspected of driving under the influence of marijuana and causing a deadly freeway crash in Fremont was released from jail Friday night. Cheryl Hurd reports. A San Jose man suspected of driving under the influence of marijuana and causing a deadly freeway crash in Fremont was released from jail Friday night. 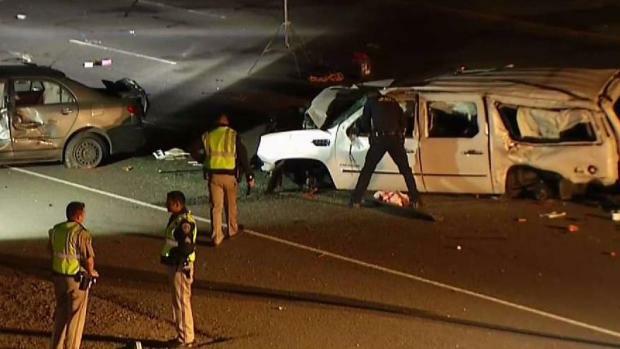 Dang Nguyen Hai Tran, 21, was arrested late Tuesday following a five-vehicle crash that closed all lanes of northbound Interstate 880 in Fremont. Officials suspect he was under the influence of marijuana when the crash occurred. The Alameda County District Attorney's Office on Friday said it was not ready to file charges in the case and have sent the case back to the California Highway Patrol for more work. 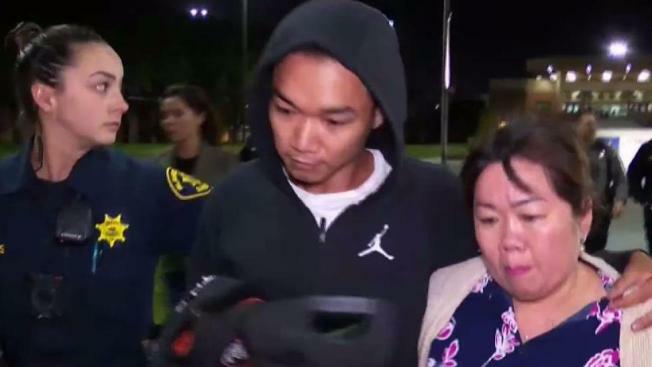 Tran was released from Santa Rita Jail in Dublin around 8 p.m. Surrounded by his family, he was escorted out and quickly got in his car with no comment. Three people were killed late Tuesday night in a five-vehicle crash that closed all lanes of northbound Interstate 880 in Fremont, and officials say the driver suspected of causing the wreck was under the influence of marijuana. Ian Cull reports. Tuesday's crash left three people dead and five others hurt, according to the CHP. A 12-year-old girl is still fighting for her life in the hospital. The three people who died have been identified as Noelle Johnson, 39, 14-year-old Christy Limas and 9-year-old Brooke Limas, all of Manteca. Minutes before the crash, several 911 callers reported a reckless, speeding driver on the major East Bay freeway, according to officials. The CHP said Wednesday that the 2002 Toyota driven by Tran was traveling northbound on I-880, south of Stevenson Boulevard and for unknown reasons made a lane change to the left, apparently causing the vehicle to collide with a 2015 Cadillac Escalade. Both vehicles lost control, causing the Toyota Camry to veer left and the Cadillac to overturn, the CHP said. Four passengers were ejected from the Escalade, including the three who died at the scene. None of them was wearing a seatbelt, the CHP said. The crash, which occurred at about 9:30 p.m., shut down the northbound lanes of the freeway and backed up traffic for about three miles, the CHP said. Three people were killed late Tuesday night in a five-vehicle crash that closed all lanes of northbound Interstate 880 in Fremont, and officials say the driver suspected of causing the wreck was under the influence of marijuana. Melissa Colorado reports. The crash remains under investigation, the CHP said. A GoFundMe page has been set up for the Limas family.